During periods of strength in SGD, the 3-month LIBOR-SIBOR spread tends to widen (Figure 1). We expect SIBOR to remain elevated. Firstly, the March 2019 LIBOR-SIBOR spread is only at +0.66% as compared to the historical average of +1.00%. Secondly, unless the SGD depreciates significantly, it is unlikely for this positive spread to narrow further. As per Figure 1, the LIBOR-SIBOR spread tends to widen during periods of SGD appreciation and vice versa. Unless there is a significant depreciation of the SGD, we do not expect the LIBOR-SIBOR spread to narrow much more. 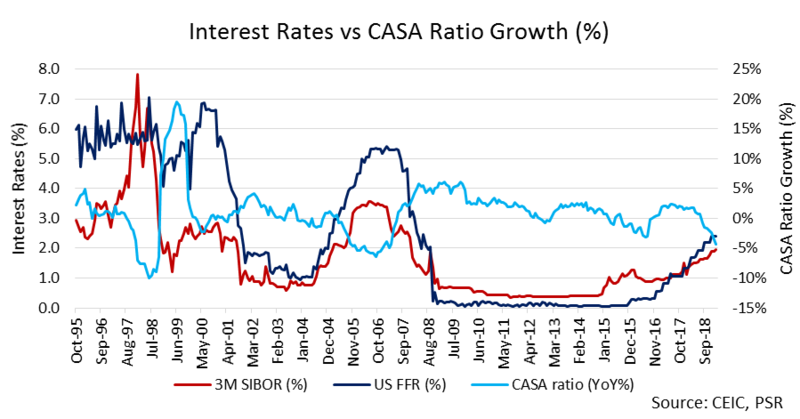 We believe there is still room for SIBOR and SOR to rise in the next three months due to the lagged effect of interest rate pass-through from the US Federal Reserve rate hikes. However, with the recent pause in a rate hike and dovish stance from the Fed, now is the best and probably last time for Singapore banks to hike their board rates and reprice their loans before interest rates start to tail down. After the implementation of further property cooling measures in July 2018, mortgage volume fell, and UOB was wary of increasing interest rates too soon. Coupled with their drive to raise fixed deposit funds, UOB was facing pressure on Net Interest Margin (NIM) improvements, resulting in relatively flat NIM in FY18. NIM growth for 1Q19 and 2Q19 will arise mainly from UOB’s retail mortgage book repricing while SIBOR and SOR remain elevated. Around half of the mortgage book could be repriced from the hike in board rates with the full effect on NIM to be seen in 2Q19. Although wholesale loans are tricker to reprice due to the more substantial bargaining power of institutions, UOB will be able to grow fee income from product and service expansion (i.e. loan restructuring fee). UOB’s 4Q18 CASA deposits growth slowed to 5.2% YoY, the slowest in 3.5 years; while fixed deposits grew 7.8% YoY, faster than FY18’s average of 3.7% YoY. With a higher proportion of fixed deposits in the deposits mix, the cost of funds rises, making it challenging to achieve NIM expansion. However, we expect competition for fixed deposits to taper off in the next 3-6 months and funding pressure to ease since there are no more rate hikes expected in 2019. As interest rates rise, the amount of demand deposits decreases as investors redirect their funds into higher yielding investments such as fixed deposits. 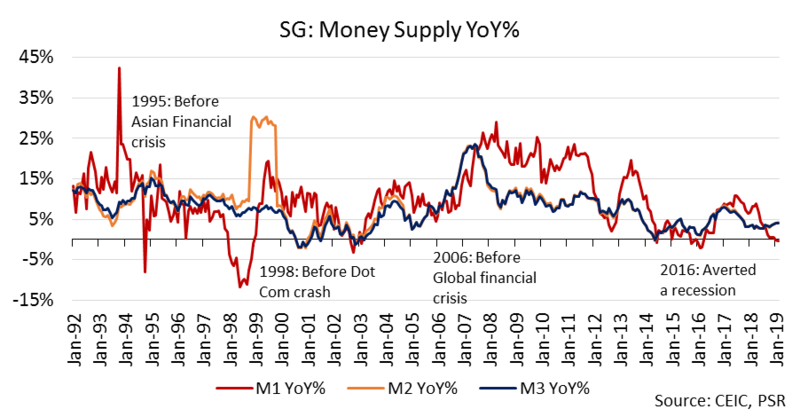 As a result, we saw the growth of money supply M1 slowing to 0.4% YoY in Feb’19 while M2 and M3 rose 4.2% and 4.1% YoY respectively. Mortgage loan growth will still be available for UOB due to the progressive drawdown of the mortgage. We forecast a 4.5% mortgage growth for UOB in FY19e, in line with the low-single-digit guidance. Overall loans growth continues to be held up by demand from non-bank Financial Institutions and Property funds. Property funds have healthy demand for loans in their commercial properties and even data centres development or acquisition activities. UOB’s market share of SGD loans and deposits in Singapore remains sizeable at 23% and 21%. Ample provisioning has been done for the Oil and Gas (O&G) sector loans. UOB provided for as much as 70-80% of its O&G exposure with collaterals marked down by 90% of its asset value. There is currently no systemic issue across the O&G sector. New NPA formation has been trending towards normalised levels of around S$500m each quarter. UOB practices conservative provisioning for wholesale loans, whereby certain loan defaults that have yet to past the 90 days limit (set by the Monetary Authority of Singapore) were classified as Non-Performing Loans (NPLs). All three banks have similar NPL ratio of 1.5% as of FY18. 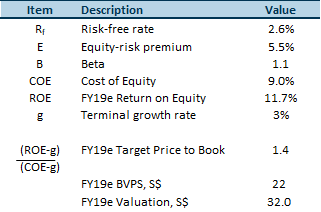 Our FY19e NPL ratio for UOB is 1.55%, in line with guidance. UOB’s dividend policy is for full-year dividend payout to be at 50% (including special dividends, if any), subject to a minimum CET1 ratio of 13.5%. As of December 2018, all three banks have similar CET1 ratio of 14%. We expect the robust capital ratios to sustain current payout levels and we forecast UOB’s FY19e dividend yield at 5%. UOB renewed its bancassurance deal with Prudential on 10 January 2019 for 15 years for a sum of S$1.15bn paid to UOB by Prudential. The S$1.15bn income will be amortised over this period. UOB will be distributing Prudential’s suite of products as part of the wealth management services but not limited to Prudential if the requested product by the customer is unavailable. The newly launched UOB digital bank in Thailand targets the middle-affluent, mobile-savvy millennials who want to be engaged in a new type of banking platform. UOB’s Digital Bank aims is to gather deposits at the moment. The ability to transfer funds that are offline into an online platform was made accessible with the launch of PromptPay in 2017. PromptPay is an interbank mobile payments system backed by the Thai government to enable money transfers at a cheaper rate than those offered by traditional Thai banks. UOB’s Digital Bank partners with the local telecommunication companies to assess the creditworthiness using the phone bill payment history of its customers. 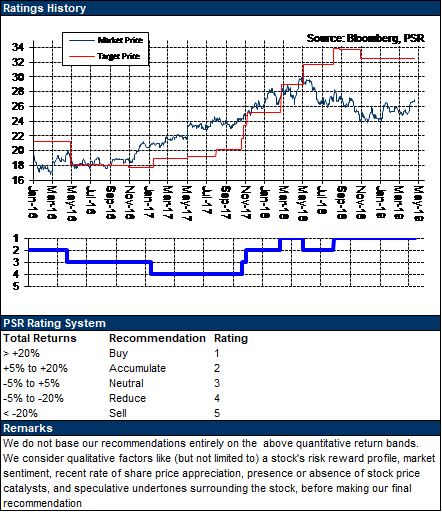 Maintain BUY with a lower target price of S$32.00 (previous TP S$32.50) based on the Gordon Growth Model. Due to the increasing funding pressure from steep growth in fixed deposits and flat loan growth in the banking industry, we pen in a more conservative FY19e NIM forecast of 1.82% (previously 1.84%), resulting in a lower target price. Even after achieving record high ROE in FY18, UOB guided a higher ROE of 12% in FY19e, showing that the effective cost measures, NIM improvement and low provisions should provide further upsides to earnings in 2019. We forecast earnings growth of 7.6% and a dividend yield of 4.7% in FY19e. North Korea said it had tested a new tactical weapon, in an unconfirmed move that comes as Washington and Pyongyang remain at an impasse following the failed Hanoi summit between Kim Jong Un and Donald Trump. Chipmaker Intel conceded on Tuesday it would not release a 5G smartphone modem and was axing its plans to do so, just hours after rival Qualcomm made peace with Apple and set in motion a new era of co-operation between the companies. Samsung’s $2,000 Galaxy Fold phone is breaking for some users after a day or two of use, CNBC reported. A review unit given to CNBC by Samsung is also completely unusable after just two days of use. Nippon Paint has struck a deal to buy Australian paint and coatings maker DuluxGroup for A$3.8bn ($2.7bn) as the Japanese company seeks to reduce its reliance on the volatile Chinese market. Indonesian President Joko Widodo is leading the race to be re-elected, with pollsters giving him an edge over rival Prabowo Subianto hours after voting closed on Wednesday. ST Engineering has completed the Acquisition of MRA Systems, LLC, at a net consideration of about US$506m (approximately S$683m) in cash, subject to post-completion adjustments for debt-like items and working capital. Keppel Offshore & Marine's (Keppel O&M) subsidiary, Keppel Shipyard, has received final approval to begin full conversion works for the Gimi Floating Liquefaction Vessel (FLNG) project, worth some US$947 million. The Singapore Exchange’s regulation unit (SGX RegCo) has instructed Ayondo to justify and put on hold its plan to dispose its 99.91 per cent-owned UK subsidiary Ayondo Markets Limited (AML), pending clarity over the group’s financial situation as well as AML’s compliance with a UK authority. Out of some S$8.2 million that Cache Logistics Trust received in an earlier dispute resolution, about S$7.4 million qualifies for tax transparency with the rest being subject to tax. Ascendas India Trust has increased the limit of its multicurrency debt programme by S$1 billion, raising the likelihood that the India-focused IT business park real estate investment trust will be looking to borrow more funds. YuuZoo Networks Group Corp has announced the cessation of Mohandas, its former chief executive officer (CEO) who goes by one name only, as a non-executive director. Blumont Group has appointed Lee Tak Meng as its new chief executive officer (CEO) with effect from Apr 17, it announced on Wednesday night. Developer SingHaiyi Group and its joint-venture (JV) partners - Suntec Reit and Haiyi Holdings - on Wednesday announced that UBS Singapore has signed on to take up all the office space at the redeveloped Park Mall building. Healthy portfolio occupancy of 93.2% and long WALE of 8.0 years. Income visibility from long WALE. Occupancy at Keppel DC Dublin 1 increased by 0.7pp from 61.1% to 61.8% due to retail clients – small expansion of space and a new tenant signed. Lower cost of debt due to new issue of MTN and early refinancing of loan. Average cost of debt fell 0.2pp from 1.9% to 1.7% as a result of locking in a lower Euribor on EUR50mn MTNs. Slight increase in gearing from 30.8% to 32.5% still leaves debt headroom of S$273mn, assuming 40% gearing. Revenue uplift from 2 AEIs on pre-committed lease and increase in power utilisation, 1 AEI to increase energy efficiency. Retrofitting works at Keppel DC Singapore 3 (currently at 100% occupancy) to increase client’s wattage will utilise extra power on hand and increase revenues. Cost of retrofit will be borne by client; estimated completion mid-2019 with no disruption to business. Power upgrade and fit out for client expansion will bring occupancy at Keppel DC Dublin 2 from 90.7% to 100% and is expected to be completed in September 2019 will increase revenue by c.S$2mn p.a.. AEI to improve energy efficiency at Keppel DC Dublin 1 (occupancy 61.8%) will cost S$20mn and be completed in 2020. No improvement in occupancy at Basis Bay Data Centre in Cyberjaya. Occupancy unchanged at 63.1% for eight consecutive quarters due to political uncertainty. Despite no deal flows in the past 6 months due to lack of supply of assets, the management has a healthy pipeline of off-market deals in discussion. Management is conducting a feasibility study on converting some of their office space at Keppel DC SG 5 (84.2% occupied) into data centres. Doing so will require bringing more power and equipment onsite. Local demand for DCs still strong, driven by hyperscale cloud players (colocation tenants) are looking for bigger spaces and sites to lease out. Demand for DCs under pinned by increasing cloud adoption (e-commerce, social media, online gaming and advertising) and rapid digital transformation (VR, AR and mobile data traffic). We maintain our accumulate call and raise our TP to $1.59 due to revenue additive AEIs secured by pre-committed leases and lower cost of debt. 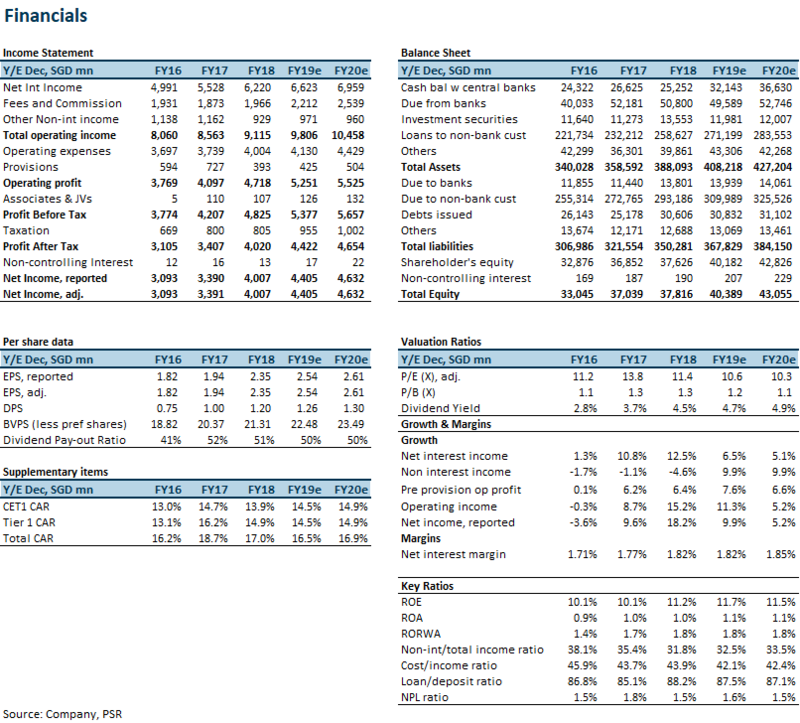 Our TP implies a 13.3% yield and 1.37 times FY19e P/NAV multiple. S-REIT yield spread declined 53bps YTD as at end-March. The S-REIT yield spread dipped further below the -1 standard deviation (SD) level as at end-March, at 256bps (261bps as at end-February). The S-REIT dividend yield of 4.64% as at end-March was the lowest in almost six years. The 10YRSGS yield eased 18bps MoM, to end at 2.07% in March. 3-month SOR eased to 1.93% as at end-March, after crossing the 2.0% mark as at end-February. CapitaLand’s acquisition of Ascendas-Singbridge had been approved by shareholders at the extraordinary general meeting (EGM) on Apr 12, 2019. The deal is expected to be completed in 3Q2019 and will see the enlarged group holding seven REITs and one business trust in total. OUE Commercial REIT and OUE Hospitality Trust (OUE H-Trust) have announced a proposed merger of the two REITs, which will see the enlarged REIT holding a combined AUM of S$6.8bn and a market capitalisation of S$2.9bn. Expected delisting of OUE H-Trust is in Aug 2019, subject to the relevant approvals. Retail: Retail sales (excluding motor vehicle sales) declined -10.7% YoY in February, mainly due to the earlier Lunar New Year period. On a seasonally adjusted basis, retail sales declined -1.8% YoY. The biggest drags were the furniture & household equipment, optical goods & books, and computer & telecom equipment sectors. The F&B index was down -1.5% YoY (seasonally adjusted) in February, dragged down largely by the Caterers segment (-8.3%). Office: The URA launched in March its Draft Master Plan (DMP) 2019, a blueprint that charts out the Government’s plans for land use over the next 10 to 15 years, that is reviewed every five years. The DMP 2019 includes a CBD Incentive Scheme which offers higher plot ratios for older buildings for certain areas within the CBD – namely, Anson Road, Cecil Street, Shenton Way, Robinson Road and Tanjong Pagar – to encourage land use conversion of older office buildings to mixed-use developments or residential/hotels. The potential redevelopment of underrented or underutilised office buildings within this area to residential or hotel use could further tighten the already-tight Grade A CBD supply. In transactions, Frasers Property announced that it “has been in discussions with certain parties who have expressed interest” in its Frasers Tower office property. Industrial: Sabana Reit’s divestment of a Tuas industrial building has been put on hold as the purchaser, Kim Soon Lee (Lim) Heavy Transport, is not prepared to further extend the long stop date. The receivers and managers of Big Box Pte Ltd are conducting an expression of interest (EOI) exercise for its Big Box mall in Jurong East. Hospitality: Average RevPAR was flat YoY in February. The slight increase in average room rates (ARR) was offset by the slightly lower average occupancy rate. In relation to the CBD Incentive Scheme laid out in the URA DMP 2019, Hospitality REITs also stand to be a benefiter given the increased flexibility for inorganic growth, with the choice of both hotels and serviced residences (the latter of which requires a residential land use permit). In addition, it was announced on April 16, 2019 that the Singapore Tourism Board will be launching an EOI exercise for an integrated tourism project at Jurong Lake District. The Ascott Ltd has secured contracts to manage 14 properties – three of which are under its co-living “lyf” brand – with over 2,000 units across eight countries. In Singapore, local co-living company, Hmlet, will open its largest co-living building to-date in Tanjong Pagar, by end-2019. While the S-REIT yield spread is currently below the -1SD level since the global financial crisis, strong rental growth should offset any adverse effects from rising interest rates – with the 3MSOR still rising despite the Federal Reserve’s recent dovish stance. We maintain NEUTRAL on the S-REITs sector, with selective sub-sector preferences. Qualcomm Inc won a major victory with a surprise settlement of its wide-ranging legal dispute with Apple Inc that includes a supply agreement paving the way for the iPhone to once again use Qualcomm modem chips. The settlement also incorporates a six-year patent license and a payment from Apple to Qualcomm, but the companies did not disclose the amount. International Business Machines (IBM) Corp reported a bigger-than-expected drop in first-quarter revenue on Tuesday, hurt by tapering demand for its latest mainframe computers and a stronger dollar. Bank of America Corp. said the interest-rate boost that lifted first-quarter earnings is likely to fade over the rest of 2019. Net interest income will probably increase 3 percent for the year, down from 6 percent in 2018 and 5 percent in the first quarter, Chief Financial Officer Paul Donofrio said in a call with investors Tuesday. A new integrated tourism development will be set up at the Jurong Lake District by 2026, in line with the Government’s strategy to "spread out its tourism offerings across different parts of Singapore". An expression of interest will be launched for the new development. CWT Pte Ltd's parent - Hong Kong-listed CWT International - missed interest and fee payments to lenders of HK$63 million (S$10.9 million), triggering a cross default under a HK$1.4 billion loan facility. Outstanding amounts under the facility stands at HK$766 million. Circles.Life rolled out a fresh referral scheme on Tuesday that promises endless data to old fans and new sign-ups alike. We are ceasing coverage on Y Ventures Group. The previous recommendation can no longer be relied upon. The share price has met our target price of S$0.16. The auditor of the company has issued a qualified opinion on the accuracy, existence and valuation of its inventories. The amount concerned is US$168,118. The auditor highlighted material uncertainty of the company to continue as a going concern.